Education inescapably shapes a child’s worldview. Few schools exist today that teach to, and live by, a comprehensive Christian worldview. We believe there are some very real gaps between what is and what can be regarding Christian education. Please see the following questions/answers for a fuller treatment of what we believe those gaps to be. How is ECS different from other Christian schools in the area? ECS, at its core, is deeply committed to this Calvinistic-Kuyperian worldview. By “Calvinistic” we do not simply refer to the five theological points identified by the acronym TULIP, but rather to the comprehensive lordship of Jesus Christ that impacts Christians’ involvement and influence an all arenas of life. As such, all of education must pursue the primary purpose making true disciples of Jesus Christ. A well-educated person will understand that he is created to be God’s image-bearer in this world. A true image-bearer of God will live life joyfully, embracing to the fullest extent the relationships and responsibilities God ordains for him. How one is educated deeply impacts how well he fulfills his role as God’s image-bearer. Most other schools, public and private alike, teach a de facto dualism. That is, there are two domains, spiritual and secular, that touch each other only tangentially. We believe that no such separation exists and that one’s education should reflect that. Academically, ECS approaches all disciplines as facets of the same diamond radiating the glory of God. Many schools teach subjects in a disjointed and sometimes contradictory fashion. At ECS, theology is elevated to its former place as the Queen of Sciences and all other subjects are understood to be part of God’s natural revelation to mankind. We believe that individual subjects become more coherent when seen as part of a total body of knowledge rather than as disparate subjects with scant relationship to each other. Most Christian schools do not have a Calvinistic-Kuyperian worldview and/or do not approach the study of subjects as part of a comprehensive and cohesive body of knowledge pointing to a sovereign God. For families who desire a more conventional Christian school in the Marysville area, we encourage you to investigate Grace Academy. 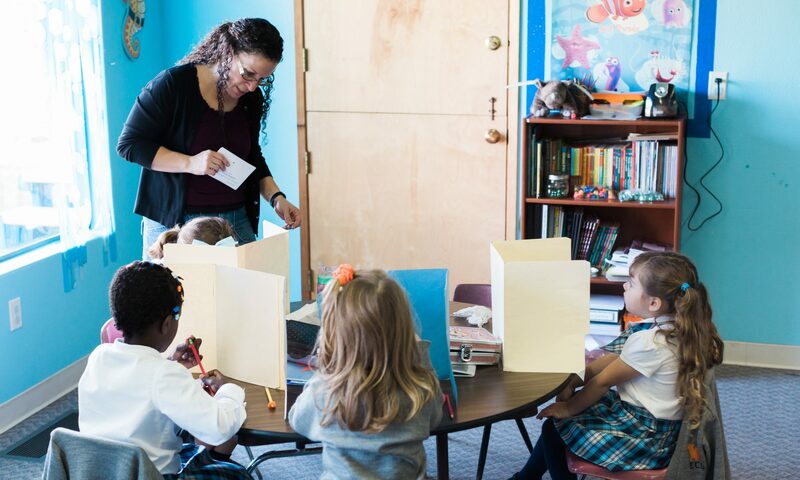 For families who desire a classical education like described above, but who live in Everett and south of Everett, we encourage you to investigate Providence Classical Christian School. For families who desire to provide a classical education at home, we encourage you to read The Core by Leigh Bortins and check the resources (print and online) from Veritas Press. The emphasis is on learning the basic ‘grammar’ of core subjects. Lots of emphasis on memorization and rules. Children at this age readily learn by rote. During this phase children naturally enjoy debating. The emphasis is on learning the rules of logic and how to make good arguments and refute fallacies. In this phase the student learns how to communicate persuasively and eloquently. The three emphases in a classical education (Grammar, Dialectic, and Rhetoric) comprise the Trivium. For more, please read our Vision of Education for ECS and the recommended resources. What is the connection between ECS and Trinity Evangel Church? Evangel Classical School is an independent school, meaning it does not have an official connection with any local church. This means that it is possible that one day the staff and leadership of the school may not include anyone from Trinity Evangel Church. However, the motivation for ECS is a comprehensive worldview of Christ’s lordship that drives the ministry of TEC. ECS is first intended to be a way to help parents at TEC to inculcate the children with this comprehensive worldview, to equip them to be champions of Christ’s lordship, and to be winsome and effective ambassadors for Christ in the world. What about prerequisites for parents and for students? We recommend that parents familiarize themselves with the classical Christian model of education. We’ve provided a list of suggested resources on this page. Because we understand that most of our students will not be coming from other classical schools/homeschool programs, there are no specific prerequisites for students this first year. Not right now. After a probationary period of five years, we will likely pursue accreditation through the Association of Classical and Christian Schools. The ACCS has significantly different criteria for accreditation from most other accrediting organizations, though rigorous. While we have large dreams for ECS, we realize it will likely have a fairly humble beginning. We trust God to take this tiny seed of faith and grow it as He sees fit.